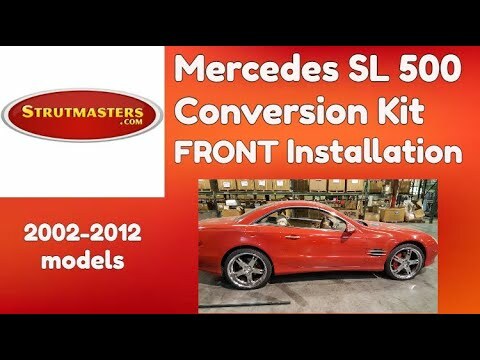 Strutmasters 2002-2012 Mercedes Benz SL500 Four Wheel Active Hydraulic Suspension To Passive Suspension Conversion System is the perfect solution to your expensive and complicated suspension problems. Designed to be very affordable, you can convert your ENTIRE electronically-controlled hydraulic suspension to use passive struts and coil springs for less than the price of replacing ONE Original Equipment strut at the dealer. 2002-2012 Mercedes Benz SL500 4 Wheel Hydraulic Suspension Conversion Kit With Light Fix (MX14FM) is the perfect solution to your air suspension problems. Designed to be very affordable, you can convert your air suspension to use standard. The SL500 active hydraulic suspension is one of the most complicated and expensive suspensions ever offered in a vehicle sold in North America. 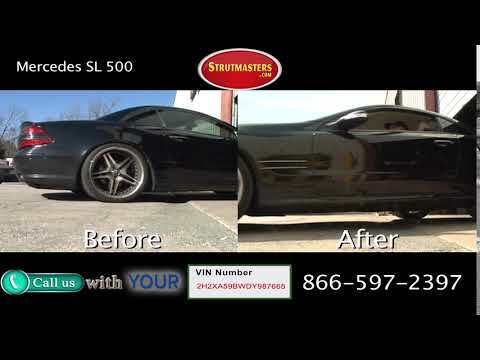 The Strutmasters suspension conversion system allows SL500 owners the ability to bypass all the electronics and eliminate the headaches caused by the factory suspension system once and for all. The Strutmasters kit uses variable rate coil springs that deliver a great ride quality and eliminate the need to purchase "anti-sway" bars that can take up to 15 labor hours to install with other products on the market. Designed and assembled by hand in small batches in the USA, this kit comes complete with one custom-designed suspension light fix module and four completely pre-assembled coilover struts. Customers appreciate our detailed instructions and online installation videos to assist with their repair. If further help is needed, Strutmasters' technicians are available to answer any questions. If that isn't enough, the quality parts are backed by our Lifetime Limited Warranty. Compared to direct replacement at the dealership and individual part replacement, this kit can save SL500 vehicle owners up to $7000 in parts and labor costs. 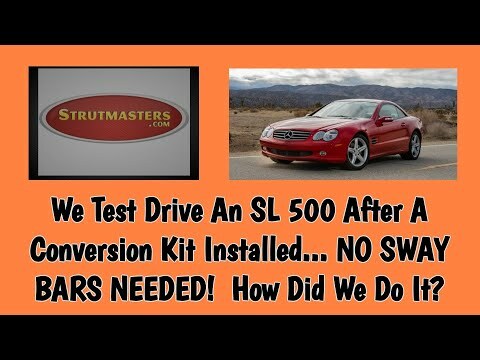 How Do I know If My SL500 Air Suspension is failing? A sudden loss of three to five inches of ride height on any or all of the four wheels is the most obvious sign of a problem on the 2002-2012 Mercedes-Benz SL500. Early detection of a bad suspension is the key to avoiding total failure. Check for hydraulic fluid leaking from the struts, lines, connection points or the pump itself. If the fluid level gets too low, it can burn out the pump and lead to a wide-spread failure of the system. A sudden loss of power steering and you'll know the pump has most likely failed. A suspension warning light, at times accompanied by a chiming noise, is another sign of trouble. And because this system is so complicated, replacing just ONE part will seldom solve the problem. Many experience technicians will recommend replacing ALL of the major components of the factory suspension to have a high rate of success. This type of complete repair can be in the neighborhood of $9,000 to $11,000! + Hydraulic Strut Assemblies ($1,790/strut) ) + Hydraulic Pump ($1,940) = TOTAL: Over $9,000 (and that doesn't even include replacing electronic components that are known to fail such as the height sensors). + Hydraulic Strut Assemblies ($850/strut) ) + Hydraulic Pump ($1,230) = TOTAL: Over $4,600 (and that doesn‚Äôt even include replacing electronic components that are known to fail such as the height sensors). 2002-2012 Mercedes SL500 Active Hydraulic Struts (x4)- -- A long tube (similar to a shock absorber) that fills with hydraulic fluid forced in at varying rates of pressure determined by sensors on the vehicle. The strut is the resting place for a steel coil spring, which works to help support the weight of the vehicle. The struts are known as "active" because they can be adjusted hundreds of times a minute electronically. Much like a shock absorber, the strut dampens vibration and bouncing caused by travel on rough road surfaces. 2002-2012 Mercedes SL500 Height Sensors (x4)- A linkage located near each wheel of a vehicle that electronically measures the height of the vehicle, and reports this information back to the control module so that the computer can identify if changes in height need to be adjusted accordingly. The ride height sensor is a moving part, and like all moving parts, they will eventually wear out. 2002-2012 Mercedes SL500 Hydraulic Lines- Tubes that carry hydraulic fluid from a pump to each strut at a high rate of pressure. 2002-2012 Mercedes SL500 Hydraulic Pump - A mechanical pump that delivers hydraulic fluid throughout the system at a high rate of pressure. On many models, the pump may have a second reservoir that works to deliver power steering to the vehicle. The pump can fail due to normal wear and tear OR it can burn up due to low fluid level caused by leaks in the suspension system. 2002-2012 Mercedes SL500 Suspension Control Module- A computer which is responsible for the operation of the active suspension system and maintaining the vehicle's correct ride height. 2002-2012 Mercedes SL500 Rubber O-rings - Although they are the least expensive part of the air suspension, they are responsible for maintaining the seal where all of the hydraulic lines connect. Be sure to replace the O-rings when repairing any active suspension system.